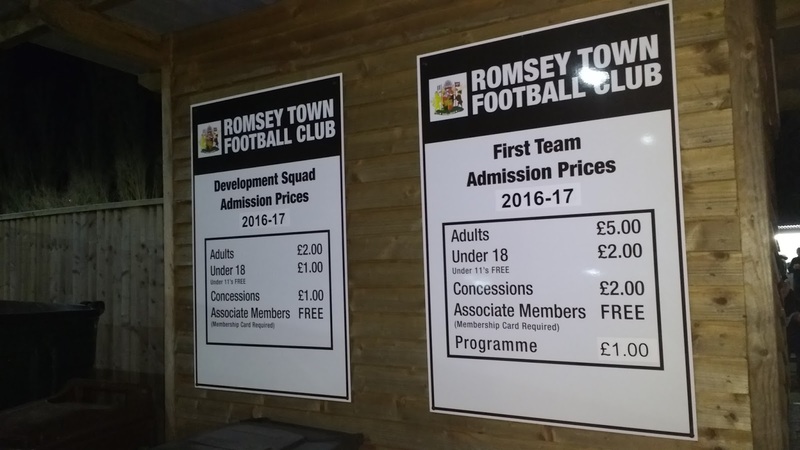 ROMSEY TOWN FC was formed in 1886 and for much of their early history played in local competitions, such as the Southampton League and Hampshire League. In 1986 they became founder members of the Wessex League and despite struggling in their first season, things soon picked up and by 1990 they were champions, with the then step 4 competition win being by far the most successful season, league placing wise, in their history. A change of management in the next few years saw them have a terrible 1992/93 season with a bottom-placed finish and relegation back to the Hampshire League. 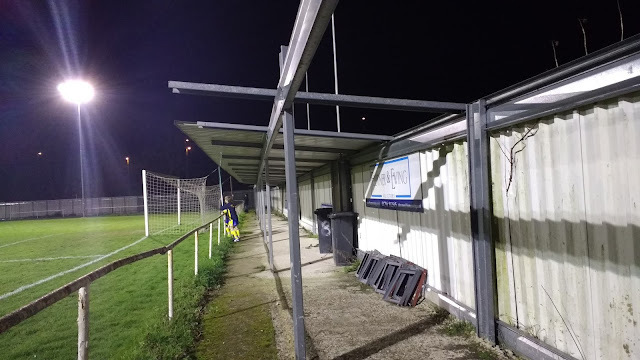 The next decade was an erratic one, with relegation to the second tier of the Hampshire League, but by 2004 they were back in the Wessex League, albeit in its new Division 2 step 8 league. Despite a bottom half finish in 2005/06, their good facilities saw them promoted to Wessex D1 and their new surroundings proved to be a catalyst to success, with a 3rd place finish in 2007, and promotion to the Wessex Premier. They'd survive there for 7 seasons, with a best finish of 8th was achieved in 2012. Following a relegation, they've played in Wessex D1 since 2014/ Mid-table finishes have been the order of the day ever since, with that continuing this season, with them sitting in 14th at time of kick off. 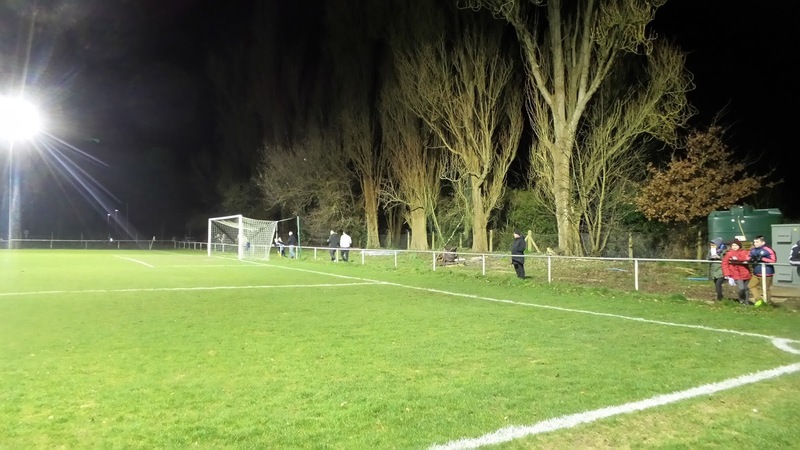 They'd face a tough test in the form of runaway leaders Hamble Club who had lost just twice all season. 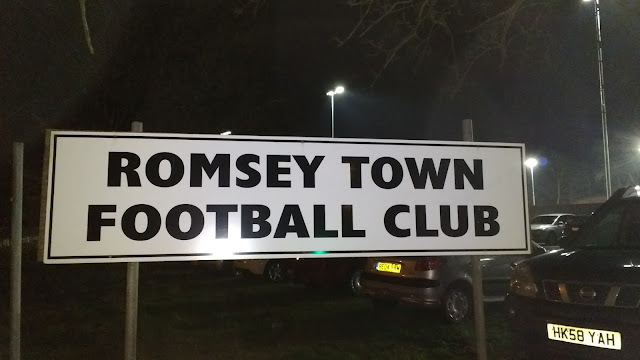 In the FA Cup Romsey Town reached the FA Cup 4th Qualifying Round. After beating Frome Town, Chard Town, Stroud (now known as Forest Green Rovers) and Newport IOW, they lost out to Sussex League side Littlehampton Town and missed out on a plum home tie against Football League side Northampton Town in the process. They've never had a great run in the FA Vase, but have reached the third round twice, losing to Three Bridges in 1982/83 and Bridport in 1988/89. 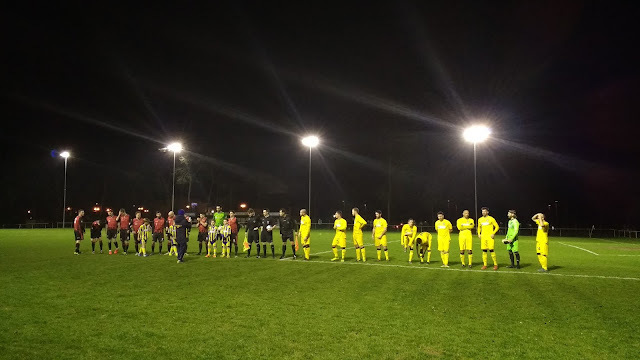 There has been success in local cups, with the most notable win coming in 1979 when they lifted the Hampshire Senior Cup, beating Farnborough Town 1-0 in a match played at The Dell, Southampton. 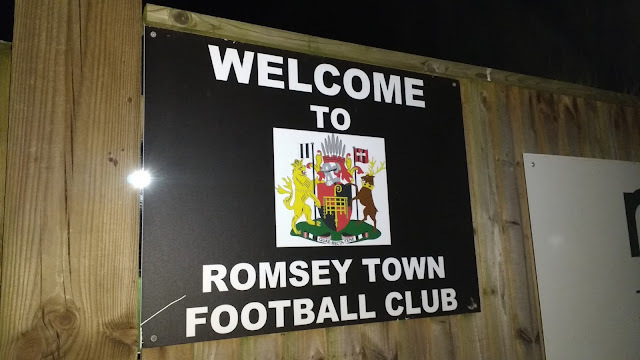 Famous past residents of the town of Romsey include footballer Nigel Spackman, cricketer David Gower and TV gardener Charlie Dimmock. 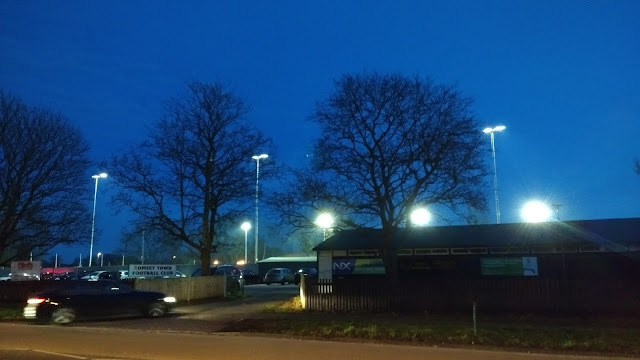 I love a bit of Friday night football to wrap up the week, with me normally heading northwards and giving other hoppers a lift to help out with fuel costs. However, with all of my contacts otherwise engaged, or geographically out of the way, I decided to head south for once. 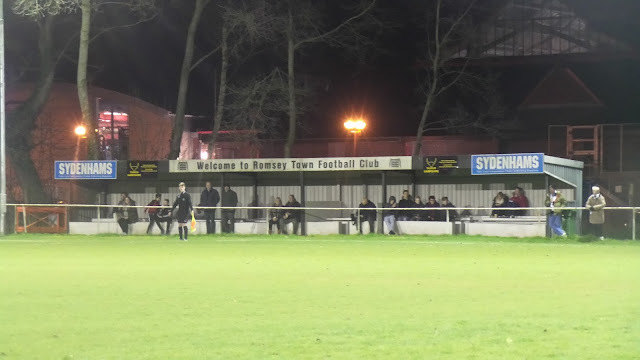 Romsey Town fitted the bill, as they were playing their first ever Friday night game, against league leaders Hamble Club in the Wessex League Division 1. It wasn't too far in terms of petrol costs and there were a couple of decent pubs near the ground. I started researching the club the night before and was really looking forward to the game, with me seemingly not being able to get enough football at the moment. I'd been past the ground before, as a passenger in a car on the way to somewhere on the south coast with my parents. Normally I'd have asked to stop and have a look, but at the time step 5 and 6 football wasn't really on my radar, with me not being a groundhopper at the time, and only really recognising football as low as the Southern, Isthmian and NPL leagues. On the day of the game, it was a busy day at work, even so, I left at 1.15 as I still had a bit to catch up on at home. I came home, and had lunch and then a bath before I finished updating my North Greenford United blog, following my revisit on Wednesday. I just had enough time to draft up a list of possible games for next week, before getting my things together and leaving at 4. It was a bit slow getting out of Wycombe in the rush hour, but apart from a small delay on the M4, that was my only issue on the journey. 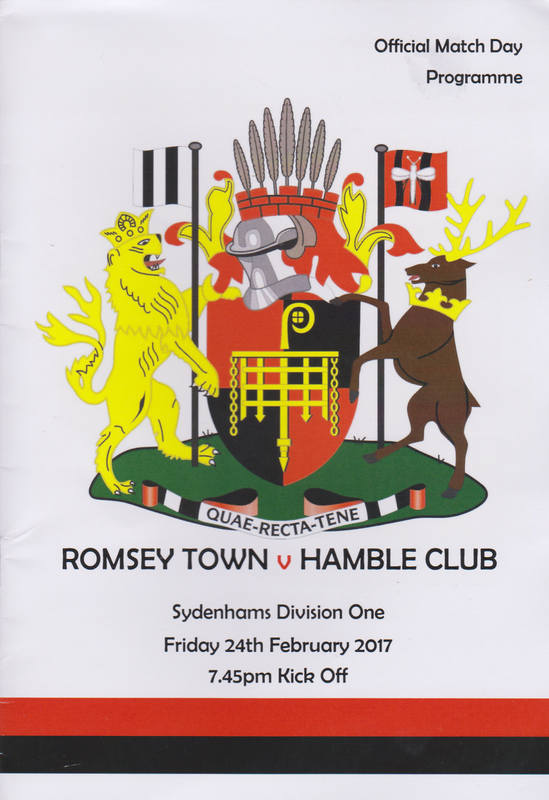 I got to Romsey at 6, picking up a programme for £1 before heading into town. My first port of call was the Bishops Blaize. This promised 3 real ciders on tap,, but they only had Old Rosie which was pretty strong and one I'd had several times before. The Tipsy Pig was a lot better, with two new tries in Angry Orchard Dry and Orchard Pig Reveller. Being of low strength, both amounted to around the same as a pint of Old Rosie in terms of units. What was very useful, was that the venue was an Untappd Verified venue, meaning I could check on my phone what was on sale, and I wish more places did this as it would save me time. From there I went to Aldi, getting various bits plus some chicken for dinner. I picked up a few new ciders and it was proving a productive night on that front. From there I made my way to the ground, paying a bargain £5 entry. I was also still peckish, so I got some chips from the tea bar for £1.50. 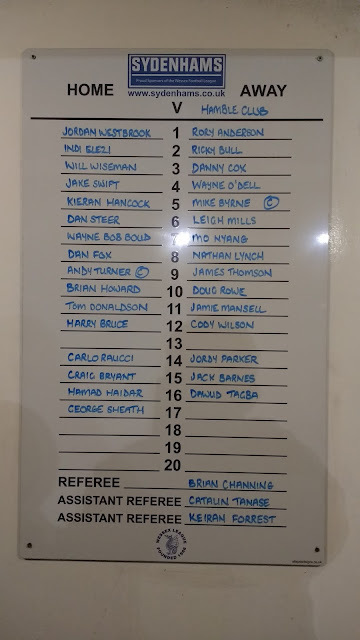 The game started in a bright fashion, chances for both sides, but Hamble looking the most accomplished as you would expect from their respective league placings. 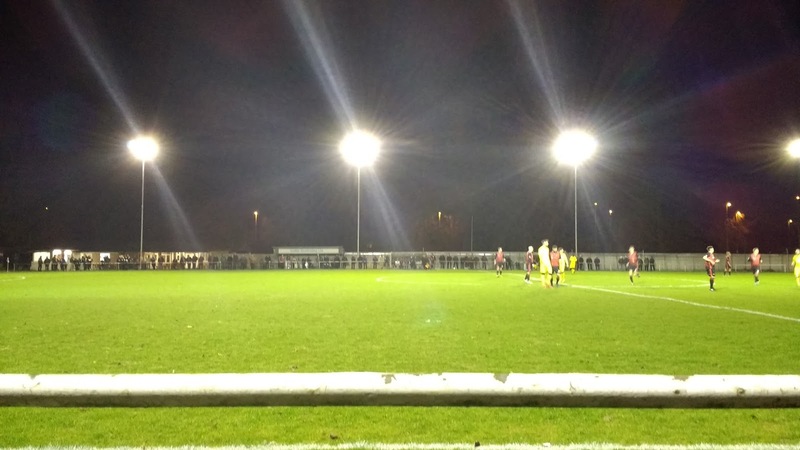 The hosts started to settle and grow into the game as they had a good spell of possession and chances. It was Romsey Town who took the lead ten minutes before half-time when Tom Donaldson's half-volley from around 8 yards found the net. There were further chances for both sides, but the hosts clung on to seal an excellent victory. 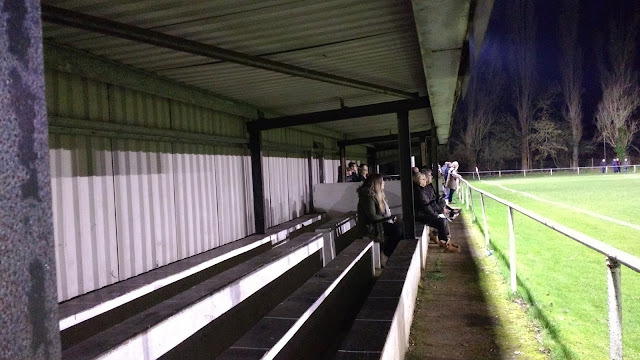 Initially, I'd been disappointed when I saw the attendance was 134, But upon further investigation, it was well up on Romsey's previous highest attendance of 85 and just one short of the best attendance of the season which involved Totton & Eling. Yet another example that Friday football works, but it's still a rarity. I can only hope that other clubs and leagues have their eyes open, as the extra revenue created must be invaluable. I left at 9.40, listening to some tunes on the way home as I drove home in a good mood. I was home by 11, having a couple of ciders and typing up my blog before going to sleep. 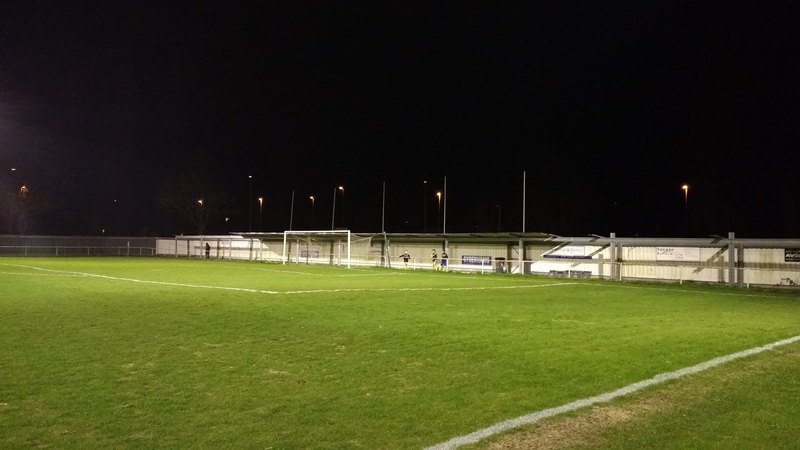 THE BYPASS GROUND is a decent and tidy ground for step 6 and would be probably acceptable for step 4. There's a decent sized stand with bench seating for around 150. 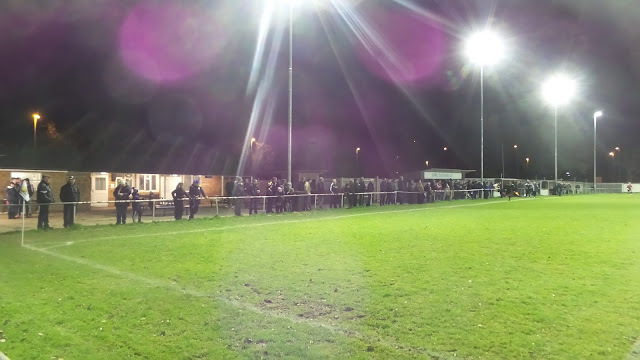 There's cover on two other sides as well, with the rest being open and with an overall capacity of 1500. 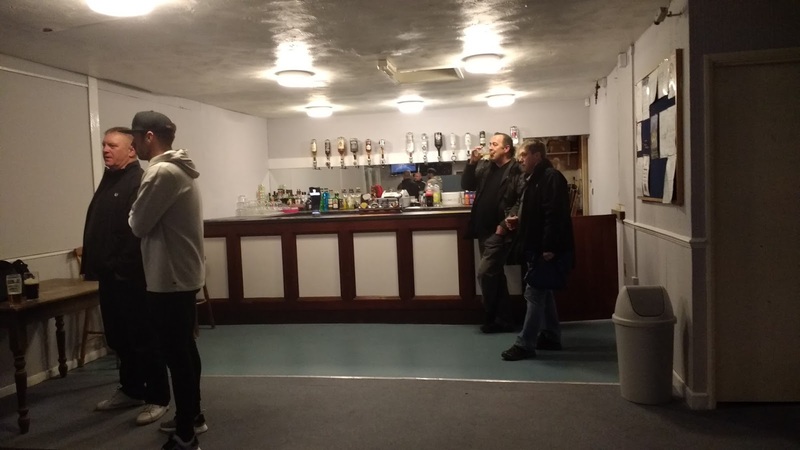 The bar is quite basic, with Strongbow for cider drinkers, so your best bet is to head into town, where the Tipsy Pig is excellent and if you have the Untappd app on your phone, you can see what they have on. 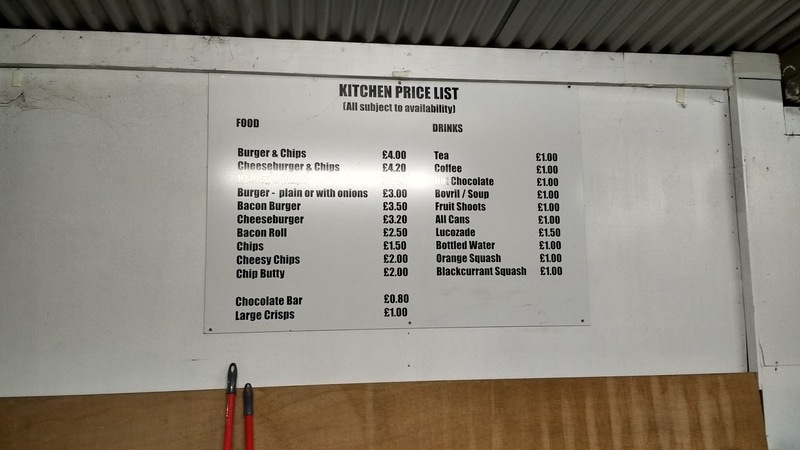 The tea bar is decent, with a wide range of stuff on sale. From what I saw in town, you are better off spending your money there as the takeaways in town are largely uninspiring unless you want to spend a packet.